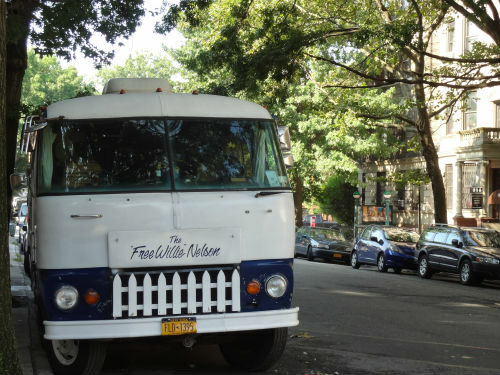 Pictures of this “Free Willie Nelson” RV have surfaced on the internet for years. It’s been parked around New York City, in the West Village, in the East Village and most recently on 8th Avenue and 8th Street for awhile now. Here’s good friend Lisa, from Texas, by the RV a couple summers ago. 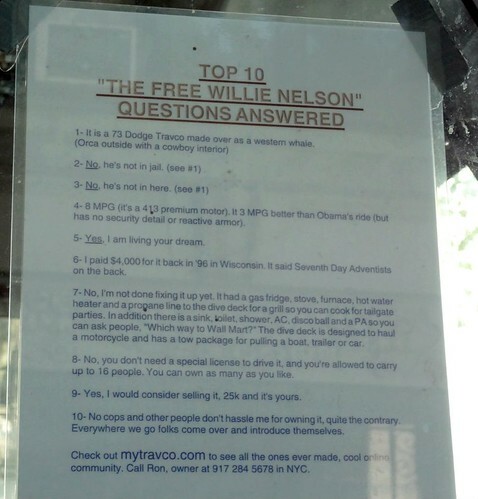 The RV’s owner has posted the “Top 10 The Free Willie Nelson Questions” in the window. Thanks to www.brownstoner.com for the recent photos. Lisa, from Texas, saw the Free Willie Nelson when she was in NYC a couple summers ago. “It’s mine. The idea is the outside is painted like an orca (Free Willie) the inside is old warm cowboy, Americana (Willie Nelson) hence the Free Willie Nelson. Thank you for your kind remarks about the Free Willie Nelson. Unlike every other vehicle parked in the streets of manhattan the Free Willie Nelson gives back to the community with a nice deck on the rear where people can sit and smoke, eat a snack, sit in the sun and watch the world go by, or chat. Often my friends come by and we sit inside and jam. It’s worth noting the Free Willie Nelson is the same size as my apartment, there by doubling my living space. Unlike my apartment it costs about $800 per year to own and it transports up to sixteen people out to the Mermaid Parade, Floyd Bennett Field, Dead Horse Bay, Wood-stock or away from ground zero on that terrible day. This summer we are talking about putting on a rooftop garden. I know that not everyone is going to get it or like it but if you take a man in the street pole, except for the people who want the parking spot, most all really like it. This is a ride for the nomadic spirit, the open road and a romantic time in our history when people weren’t afraid to boldly just go.